Fall has arrived in Kansas City. The leaves have burst into flame and the nights are significantly cooler. The weather has been a bit of a roller-coaster these day, much like my mind. This month has been a tough one, not by any personal life means; instead, I refer to the social and political climate of the country. I won’t get into it here, this ‘safe and happy space’, but if you’ve been feeling anything like I have this month you’re in need of some emotional comfort. 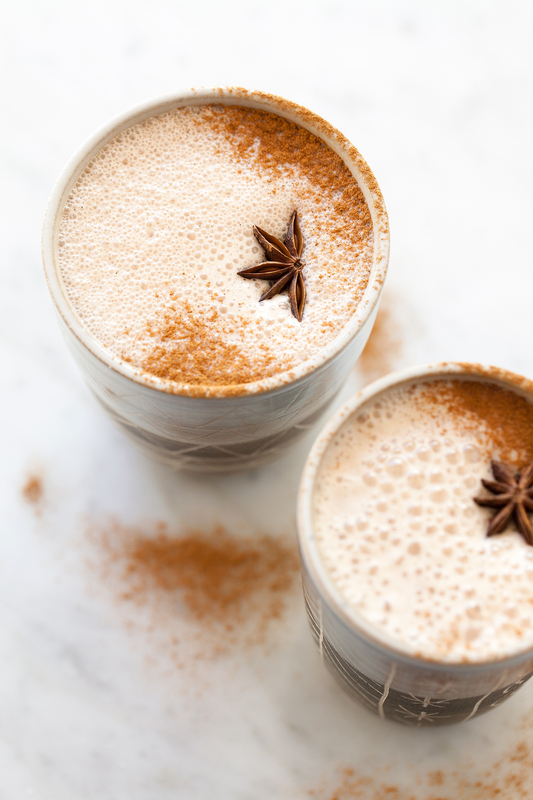 What better way to do that than with a calming and cozy Frothy Chai Hot Chocolate made with a luxurious chai-spiced milk chocolate ganache? Chai is the ultimate soother and light milk chocolate is it’s perfect companion. There are many more excellent chocolate companies out there, so enjoy exploring. Also, allow the chocolate-maker’s philosophy and commitment to creating an exceptional product to peak your interest. It’s not just about percentages on a wrapper, but their reputation of quality and consistent honesty about how their chocolate is produced. Per usual, try and use the best quality milk chocolate you can find for this recipe. A cheaper quality milk chocolate will make it much sweeter than intended and no one likes an overly sweet hot chocolate. Source milk chocolate coins/discs/bars from a local specialty grocer (Whole Foods usually has a good selection), a local chocolate vendor, or order online (save the extra for all that holiday baking). The best part of this hot chocolate is its chai milk chocolate ganache base. It’s very simple to make: steep the cream with chai spices and then mix it with the melted milk chocolate. That’s it! You now have a ganache that can be stored in the refrigerator for weeks. 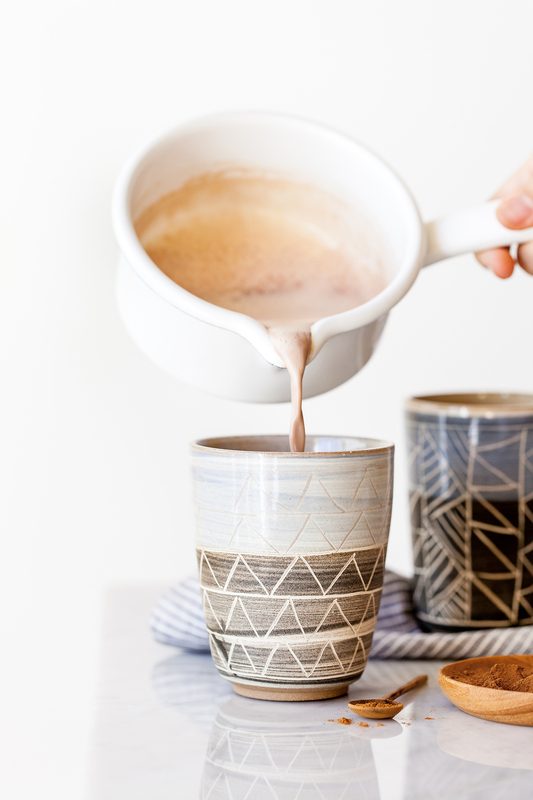 Anytime you feel like a cozy cup, just pull out the ganache and blend it with hot milk until frothy. 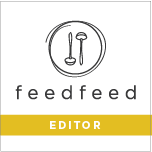 Don’t skip the pinch of sea salt either, whether fleur de sel or another type of sea salt, as it helps to balance out the sweetness of the drink. All together it makes for the most luxurious and decadent hot chocolate. Not overly rich, but still full of body. The top layer is a blanket of frothy chai bubbles and underneath that froth lies a creamy milk chocolate experience. Keep this recipe on hand for the holiday season and you’ll never go without hot chocolate through the cold winter. In a small pot, bring heavy cream, cardamom pods, black peppercorns, whole cloves, star anise, vanilla bean seeds and scraped pod, fleur de sel, and black tea to a boil. Remove from heat, cover, and let steep for 15 minutes. Meanwhile, melt the milk chocolate over a double boiler, stirring occasionally to help the melting process. A double boiler is a pot of one-inch simmering water with a smaller heat-safe bowl, filled with the chocolate, snuggly resting on top. This allows the steam to gently melt the chocolate. Or, melt the chocolate in a heat-safe bowl in the microwave, using 30-second intervals, stirring between each interval (monitor this very carefully as to not burn the chocolate). Set aside once melted. Strain steeped cream into a clean bowl and discard spices. Transfer steeped cream back into the small pot and add more fresh cream until the weight is, again, 4-ounces. Bring to a simmer and then pour over the melted milk chocolate. Using a small spatula, or spoon, gently stir the hot cream into the chocolate using small circular motions in the center of the chocolate bowl. As it combines (emulsifies) gently stir in larger circular motions until the ganache is fully combined and smooth. Set ganache on counter top, at room temperature, until firm for about 8 hours or overnight. If preferred, allow ganache to cool at room temperature and then place in the refrigerator to firm up more quickly. For the ultimate frothy experience, I recommend making a single serving of hot chocolate at a time. Place the chai milk chocolate ganache into a high speed blender and set aside. In a small pot, combine the milk and fleur de sel. Bring to a boil and pour over the ganache in the high-speed blender. Allow the hot milk and ganache sit for 1 minute before placing on the blender lid. Securely place on the lid and blend on ‘high’, for 15-30 seconds, until very frothy. 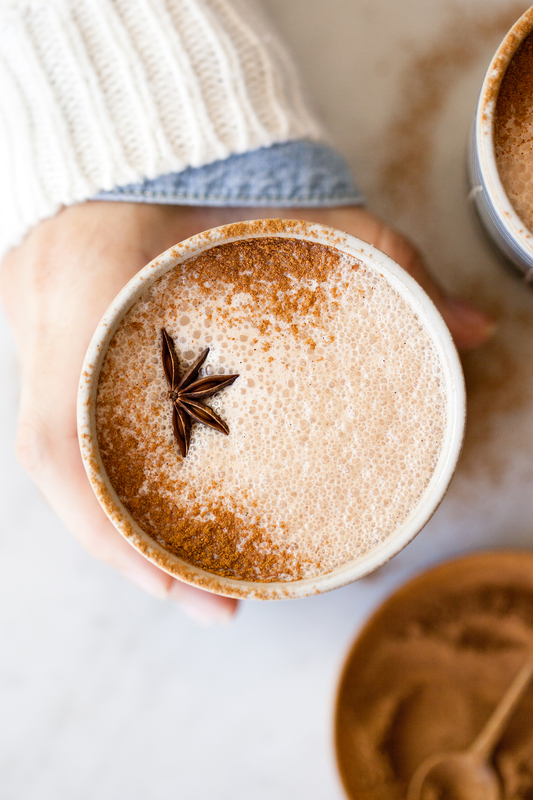 Pour chai hot chocolate into a clean mug, add star anise, and a light dusting of cinnamon to garnish. Repeat the process for the next two hot chocolates. Any remaining chai milk chocolate ganache may be stored, in an airtight container, in the refrigerator for up to 1-month. This entry was posted in Fall. Bookmark the permalink. Right?? Foxwares Ceramics made these beauties. Thank you, Laura! These would be perfect for a rainy afternoon. The fall season is truly wonderful. Absolutely sublime, Teresa. While I’ve made hot chocolate using the ganache method, I’ve not tried it with chai spices. 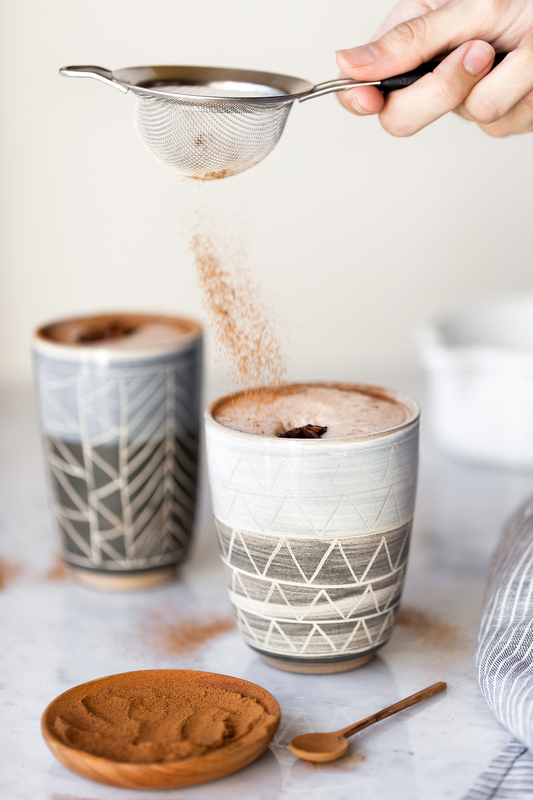 I would have never thought simple, ganache hot chocolate could get any better. Now I know! Agreed on chocolate. I’m a hound. I am partial to dark, and recently discovered Santa Barbara Chocolate Company and tried their 72% rainforest blend. It comes in nice little callets for easy handling. Have you tried Guittard? Thank you for your inspiration and beautiful work. 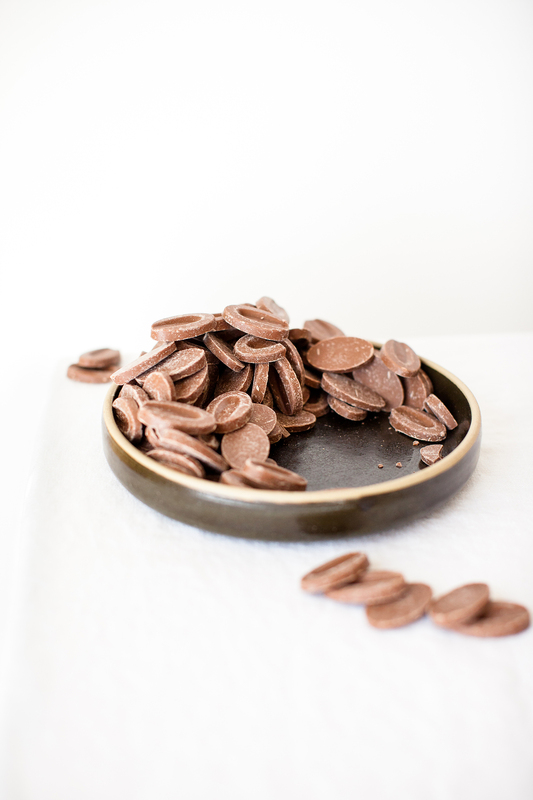 Happy to have introduced you to spiced ganache! The flavor possibilities are endless; which is why I love chocolate. It’s an unending creative source. I’m partial to dark chocolate as well, but only by a smidge. ;) There are wonderful milk chocolates out there and it saddens me to think they’re overlooked. Milk chocolate pairs so well with lighter flavors that would otherwise be drowned out when paired with dark chocolate. Thanks for the SBCC recommendation! Guittard is a great American family-owned company and I’ve listed them as a good source in previous posts. I’ve had the privilege to professionally work with various chocolates throughout the years and they’ve all been very good. However, Valrhona tops them all for me personally. It’s an incredibly beautiful chocolate to work with, the flavor is exquisite, and it’s an ethical company. Regardless of which company someone chooses though, as long as they try and use quality chocolate they really can’t go wrong. Thank you, Traci! I’m an avid chai drinker and make my own blend. I’ve made chai ganache, but have never thought to incorporate it into my chai. WOW!! I see myself feasting on this all winter!! Adore your work. Hi Jacquee! 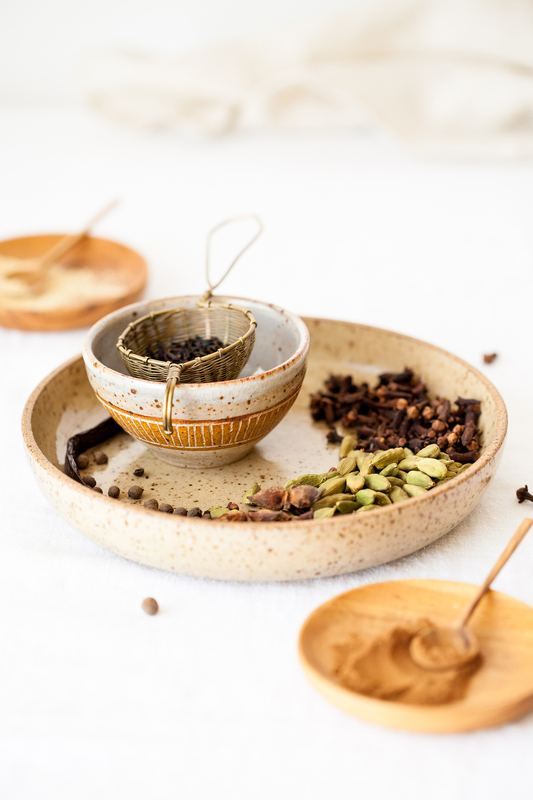 Making your own chai blend sounds delicious. It tastes even more special that way, doesn’t it? I’m excited to know that you’ve enjoyed this post. Wishing you many warm and cozy hot chocolate experiences this season and thanks for the love! I simply love your recipe here, to mix chai spice in chocolate ganache to make spiced hot chocolate. I know I would love this a LOT, cause chai spice is my favorite thing on earth! As usual you have stunning pictures 🙂 They are breath-taking! Thank you sweet, Amisha! I always love it when you stop by. :) Yes, chai is pretty much the ultimate comforter and I’m right there with you!